Narvesen is an extraordinary drummer who often lays back for long stretches, playing with the utmost restraint at times. This brings out a more subtle side to Mr. Gjerstad’s playing. Once one calms down a bit, we hear quite a bit more going on, nuance and texture-wise." "This is an LP only release and the sound, thick, warm vinyl pressing was done with immense care. The sound is superb, as is the playing by both musicians. The title of this disc is ‘Interweaving’ which is most appropriate since this duo is consistently weaving several layers of their playing together. They say love is the international language; Schlippenbach and Narvesen prove it is actually free improvisation. The duo manages to keep an arresting tension even on minimalist and sparse pieces like «Banging the Barrel», where von Schlippenbach and Narvesen create a mysterious, profound sense of tension by focusing on a delicate cymbal work and gentle overtones produces by gentle touches of the piano keys. Both play masterfully with different elements of tension building on the following «Catch Up», now turning these elements into a fast and playful chasing game. Neither of them is shy from a more conflictual, more tensed dialogue as explored on the dynamic «Hard Nosed». «String Out» distills von Schlippenbach and Narvesen highly inventive vocabularies into an enigmatic poem of fascinating and otherworldly sounds. Both play brilliantly with phrases of Monk’s iconic «Evidence» on the last, title-piece that corresponds with Monk-ish expressions in another energetic, imaginative play of ideas, forms and dynamics. Here there are not a lot of generational contradictions to talk about - they are completely aligned. They bring what they have learned and who they are into this encounter and yet another unique meeting point is conceived. "It’s delicate, stripped-down and introspective with lots of fragile short noise intersperses. Very recommendable." "The quintet carries its play in a large sector multipurpose, generating a wealth of different voices on a common dynamic frequency.. [...] By spreading it, the astonishingly multifaceted abstract sound of the spectrum becomes more diverse and colourful like a rainbow." "The sound texture in the Soundtracks recorded transmit a high sensitivity with which the group takes common expression out for new, unknown searches." "[...] the sound flow of the quintet flows pleasantly in this interesting document of the current scene of European musical improvisation." "The approaches and releases of the five instrumentalists create a well-thought-out team game that leaves no room for moments of pain and can keep the attention during all of the 40 minutes of this collective improvisation." "[...] the music is particularly appealing, when a pulse even without a clearly marked beat becomes noticeable." "Almost bombastic resonance (missing only the strings) meets intimate jazz club - The DIDRIK Ingvaldsen ORCHESTRA is well worth a discovery ... not only or even last of all for classical music lovers." "Experiments and free jazz can have a surprisingly meaningful dimension for the attentive listener." "That's what I call an excellent jazz cut!" "The Expanding Circle" is a solid dose of music for lovers of large compositions, music full of expression and unexpected solutions." "Cornua Copiae is an exciting, ever-surprising work, one that will undoubtedly appeal to listeners who not only want their jazz to entertain, but to astound." 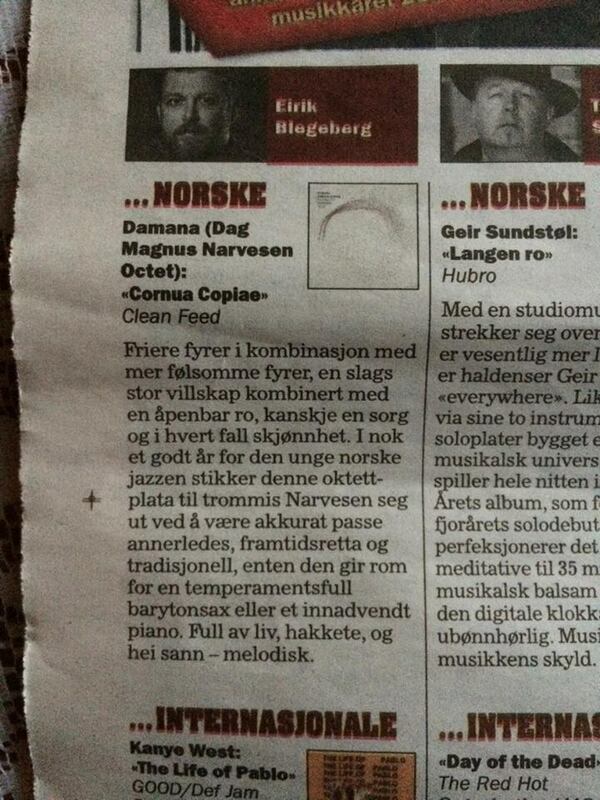 "Narvesen, who wrote all the tunes, takes the big band tradition and gives it a smart contemporary twist. It's all done without irony or pastiche, and presents a coherent facade in spite of the stylistic diversity. "The compositions on this album are fine and varied, offering a wide array of settings in which to express the band’s talent and they create music it is a uniformly interesting and moving experience." "Damana combines intensity and elegance and offers healthy resistance." Clean Feed is consistently releasing interesteing records and this is another disc to glorify life with in the autumn darkness. "A great team and brilliant - in my opinion - recording!" "I think it is all too rare that we hear well-arranged music for larger ensembles nowadays. [...] I hope that Narvesen gets the possibility to play numerous concerts with this ensemble, abundant with skilled, relatively young, Norwegian jazz musicians, who prove themselves yet again to be a part of the top shelf." 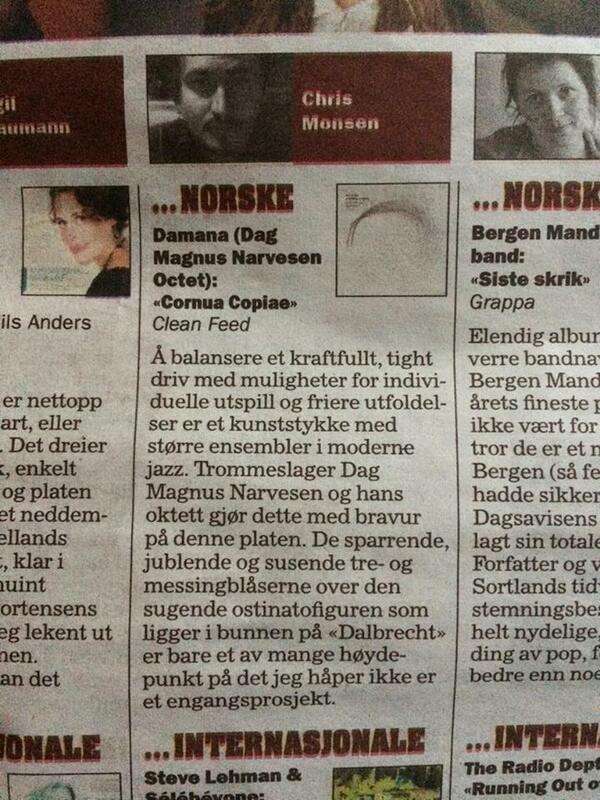 "Dag Magnus Narvesen stands out as a new and very exciting name as a composer and bandleader." "It is a musical miracle we are being served." Under the leadership of von Schlippenbach the Kitchen Orchestra has matured as one of the most exciting European big bands. His sheer breadth of stylistic output, ranging from collective improvisation, contemporary music to jazz legacy created ideal structures for this fearless and playful orchestra. In a musical landscape not very far away from Atomic, but with lots of originality and personality, we experience brilliant ensemble play, great soloists, intense tunes and hypnotising arrangements. Sasquatch appears as a band with enormous potential. With the sound of this debut still in the room and in mind, one has just to state that this is the surprise of the year so far. […] a significant element in young Norwegian jazz, mainly a place in the stylistic landscape of expressionism, the quartets of Ornette Coleman and free jazz, played by musicians who combine solid formal education with apparent willingness to sound just as raw as the style of the given moment implies. Modern quintet with guts and impact. "The odd thing here is that if I didn't know that these lads were Norwegian, I would have no clue just by listening. The bassist & drummer sound as if they have been playing together for many years, constantly swinging together and playing tightly as one force. It is difficult to pick any one horn or reeds player since each one shines when it is his turn to solo as well as provide solid interaction with the other players. [...] It just goes to show that every week some unknown group of players will deliver to DMG another gem for us to grab & hold on to for dear life." "[Sasquatch] creates music that is progressive, and fairly timeless. This is a classy affair with plenty of riches worth experiencing."